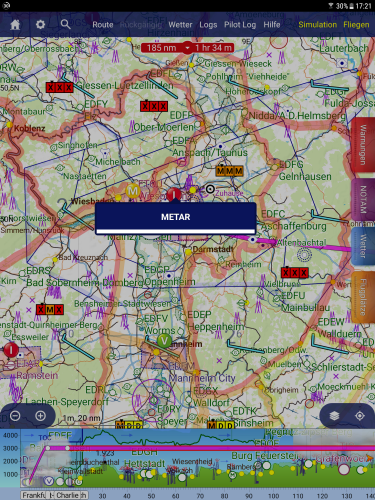 there is a fault in the new version 3.11.2 when showing Metars. The bug is on a Samsung Tab S2 and a Samsung Galaxy S6. Have you by any chance installed some recent update to Chrome on your device? I think our customer support is aware of an issue when doing that which breaks embedded web content in other apps like SkyDemon. that was the solution. After reinstalling the last Chrome-Update form 29.01.2019 Skydemon works well. Same here running v3.11.2.30323 on a Galaxy S8. METARs/TAFs are not showing, also when viewing airfield information in the airfields tab „approach information“ and „admin information“ show blank pages on every airport. I donˋt want to completely delete chrome as it is my main browser and there is no update available. Last chrome update was on 29.1.2019. How can I fix this? My phone is my primary Skydemon navigation platform, so it is very important for me that all functions are working. Airfield informations are vital! Same here running v3.11.2.30323 on a Galaxy S8. METARs/TAFs are not showing, also when viewing airfield information in the airfields tab „approach information“ and „admin information“ show blank pages on every airport. I donˋt want to completely delete chrome as it is my main browser and there is no update available. Last chrome update was on 29.1.2019.How can I fix this? My phone is my primary Skydemon navigation platform, so it is very important for me that all functions are working. Airfield informations are vital! I simply turned Chrome inactive. That can NOT be the solution to have chrome inactive when using SD.